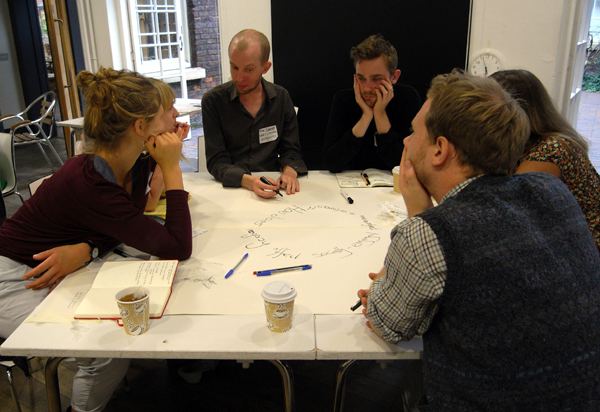 How does legacy affect socially-engaged performance and artwork? The way in which the question is worded is interesting – ‘legacy’ is typically assumed to be what follows a project (one suggested definition was that it’s ‘what comes after the evaluation’) and yet here it is at the front of the question, asking us to think on how this after-effect determines the how the project manifests or is planned. This primacy (and perhaps the actual word ‘legacy’) could be derivative of the way in which projects are pitched to funders and, as legacy can get very rigid / limiting / fixed / centralised when it becomes an essential and measurable part of a project, maybe we should be rethinking the language of legacy: bringing it back to the intention of the art / artist? We didn’t get time in any of the groups to really think how this shift in language could be expressed, though the words ‘outcome’ and ‘impact’ were suggested as alternatives. It’s not just funders that use this language though. The idea of legacy was used as significant justification for the £9bn spent on the 2012 Olympics. It was this that led to the public accepting such a massive spend at a time of austerity and funding cuts elsewhere. Although these negative effects of legacy were something that all the groups returned to, and felt needed emphasising, a number of more positive aspects were mentioned, not least the effect of intangible and personal legacies. Two kinds of memory were noted; those which are more passive, recalled in quietude and which encourage reflection, and then there are those memories which act to trigger something very active. Socially-engaged practice (amongst many others) can act to stretch imagination – suggesting different ways of being and thinking about things – the experience of an artwork or performance can encourage people to re-examine what they have otherwise taken for granted. Legacy is another word for those relations and links that can be established within a community. If, as participant, we see that it means something for the artist as well, there is greater impact. It injects authenticity into the legacy. The legacy of any project can also interact with and influence other artworks; either later works by the same artist or within the broader cultural heritage. There’s also a legacy in terms of language – the terms that are used to describe what has happened (or what will happen) come down to us from what has happened before. 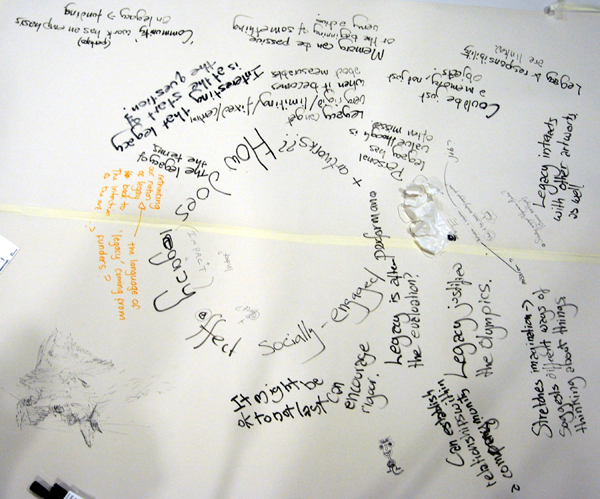 Although there is a significant link between legacy and artistic responsibility –a few horror stories were shared of people appropriating communities to serve their own research / project ends and then ‘deserting’ them when they have what they want – if there is appropriate closure to a project, and all involved understand that as the terms of the project, then it’s worth remembering that it’s perfectly ok for there not to be legacy. A project is allowed to end.